I’m not going to lie to you. I’ve struggled a lot with working while traveling. Over the years I have devoured a tremendous amount of education on productivity and effectiveness and experimented with many of these various solutions. The idealistic world of blending business and pleasure is 100% possible. I’ve done it on many occasions. Nevertheless, this blending can be the cause of much frustration, FOMO, and angst. So how does one flow through life? How do we value presence over productivity (as the amazing Maria Popova beautifully describes) rather than hustling until our limbs fall off? How do we accomplish big goals and leave a lasting contribution for humanity, while still cultivating a sense of awe (as my friend Jason Silva masterfully captures in his videos), gratitude, and “living in a beautiful state” as Tony Robbins describes? Now let me be clear — it is much easier to live in this space when we’re settled into routine. But avoiding routine is often why we chose this lifestyle in the first place. You’re likely an adventurous “wonder junkie” like me and seek awe-inspiring moments in your own unique way. When it becomes difficult to cultivate this is while we travel. We’re pulled completely out of the ordinary and our senses are electrified. We’re kids in a candy store with insatiable hunger and this conflicts with our need to be responsible about certain things, mainly around work and making money. I think perhaps a similar philosophy needs to be implemented in adulthood. So how do we maintain the same level of effectiveness in our work while traveling? My refusal to give up on a sustainable solution landed me on a method that could work for just about anyone, even me, the “I need to maximize this experience and still get all my work done” person. The solution is the REEP challenge. This is everyday Josephine. She has a more traditional career and doesn’t necessarily want to have a full workday while she travels. Things like exercise, maintaining diet/nutrition, and working on personal projects are still important to her. This could also be everyday Jeffrey. He’s an entrepreneur and business owner but more of a traditionalist when it comes to travel, in that it’s meant to be a vacation. Perhaps he’s traveling with his family, or he intends to use the trip as an opportunity to completely disconnect, rest, and rejuvenate. Health, fitness, and personal growth are still important to him. These are your modern day full-time vagabonds. Digital nomads often station themselves into a new city for weeks, months, even years. As travel lovers, a digital nomad will still feel the urge to experience the new culture and will struggle with who to balance work and play. Our game below will help them stay focused and create a daily ritual that rewards both. These are people like Natalie Sisson, who run successful online businesses and call themselves Suitcase Entrepreneurs. Natalie clearly has an insatiable thirst for travel, and having to run a six-figure plus business as she does this is no easy task. Dan Andrews and Ian Schoen of TropicalMBA are pioneers of the digital nomad world, and have gathered a large community in Southeast Asia. After personally having spent 97 days traveling throughout the region, I know how great the lifestyle can be. This means distractions, and the REEP challenge will help remedy that. Colin Wright, a writer and entrepreneur who moves to a new city for three months at a time, is famous for traveling light. Colin has in a way gamified his travels by involving his community of readers to vote on his next destination. Our next travel lover may have a home base, but they often pack up and move to new destinations at a moment’s notice. This solopreneur prides themselves on being an independent minimalist. Sean Ogle spent the first six months of his entrepreneurial career living abroad in Thailand and Vietnam. After years of living a conventional disillusioned lifestyle, he was fired from his job (that he hated), and made the move. Today, Sean is married and loves his homebase in Portland, Oregon, but he continues to travel at a moment’s notice and truly embodies a location-independent lifestyle. Josh and Jill Stanton from Screw the 9 to 5 wanted to test out what it would be like to build a business together. They started a small affiliate website working endless caffeinated nights and eventually built up their business to making over $10,000 a month…how cool is that? Many solopreneurs, entrepreneurs, and even freelancers enjoy having a home base. Yet, they’re often consumed by wanderlust and crave the adventure of life on the road. A famous example of this is NYT #1 bestselling author and entrepreneur Chris Guillebeau. 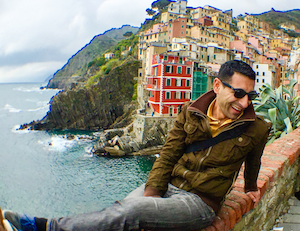 Chris went on a quest to travel to every country in the world by the age of 35 — and he did it. Oh, then he wrote a book about it. Another example is…me! Yes, yours truly, Arman Assadi. One of my core motivations for living a self-directed life is a strong desire to see the world and experience every culture. To me, it’s education that keeps my mind nimble and aware of cognitive biases. But I live in San Francisco and am lucky enough to have a modern apartment I don’t want to give up. No matter how much I travel, I love the feeling of coming home to my “old familiar pillow”. Pat Flynn runs his online business built around passive income, which allows him to spend more time with his family. Between traveling around to different cities to speak at conferences and running a major brand, productivity on the go is essential. His business enables him to plan his day around his life and family, not around his business. Chris Ducker began blogging in 2010 to document his journey of becoming a Virtual CEO. Not only did he achieve that goal, he launched another business in the midst of it all called Virtual Staff Finder, which I’ve used multiple times to hire virtual assistants. He then wrote a bestselling book called Virtual Freedom (4.9 stars on Amazon! ), and continues to run multiple business, speak around the world, travel to conferences, and maintain a life at home with his family. Gary Vaynerchuck, the author of multiple NYT bestselling books and host of the #AskGaryVee Show, is best known for loving the hustle. When it comes to keeping up rituals and staying productive while traveling, Gary is someone to watch. Rather than allow the environment to take control, Gary is proactive rather than reactive and utilizes a lot of the principles you’ll learn about below. Lewis Howes is a rock star lifestyle entrepreneur. As a New York Times bestselling author and host of The School of Greatness, Lewis spends much of his time building his brand and inspiring people to achieve greatness around the world. At the same time, Lewis also greatly values his freedom and ability to travel as a lifestyle entrepreneur. I’ve spoken to Lewis about this before and it’s clear he values his home base in Los Angeles, but he also loves the flexibility to travel at any time. If you watch Lewis on his Snapchat (username: Lewis_Howes), you’ll see exactly how he does it. One example — no matter what, he makes sure to get some form of exercise (one of the keys points in REEP) in each day, regardless of where he is in the world. Lewis plays the same game below, he’s just set up his own incentives and rules for it. The solution is this: we turn the entire event into a game. Sometimes turning difficult tasks or the formation of building new habits and rituals into games can be very effective. And in this case, I’ve found the game that I’ve developed below — inspired by The Grand Travel Experiment from ZenHabits’s Leo Babauta — highly effective. When traveling, it’s incredibly easy (and painful) to forget your morning ritual. For each of us, this is the one thing or series of activities we do each morning that puts us in a good mood/state and prepares us to rock the day. Carefully crafting your ritual is an important and fun activity I discuss in detail here. It’s natural to want to consume the local food, but this often leads to daily cheat meals that you legitimize with self-told lies, “this is the only time I’ll ever get to try pizza in Napoli!”. Maybe partly true, but problematic. Bad nutrition puts your body in an instant coma, and often leads to digestion issues, which means no work for you. It’s also a lot easier to get sick and your energy levels will decrease. This is the last thing you want when you’re traveling. Back home you might have a regular gym you visit, or perhaps you regularly play a sport or do things like Soul Cycle and Crossfit. When you’re traveling or living abroad, it’s hard to keep up any exercise routine. But getting the blood flowing is imperative, and one way or another it’s possible if you make it a priority. The REEP challenge will help. If you’re feeling down, sluggish, and low on energy — you can often trace it back to a lack of exercise or proper nutrition. A University of Georgia study proves this. Buzzfeed compiled a list of exercises that you can perform pretty much anywhere. Think of these first three areas as the foundation to your productivity while traveling. Tip from Arman: Use this travel opportunity to learn more about the culture you’re in by investigating how people exercise there and do it with them. For example, you can join a Muay Thai in Thailand and get the workout of your life. Plus you’ll get really good at kicking people in the face, which you’ll hopefully never need to do. My friend Nick took a trip to Thailand for a month just to experience this. Our goal here is balance. We want to have fun, experience life, see attractions, and create new memories. We do this by being very strict with our work schedule. Your normal workday is 8–10 hours back home. You’re likely working on high value tasks less than 50% of the time. This is where constraints come in, which help you focus on the most important tasks only. Constraints work very well for any type of work, especially that of a creative nature. Writers like James Clear often use constraints to create the work rather than wait for it. James is someone who understands that creativity isn’t happenstance inspiration, it requires diligence and the use of intentional constraints. If you have a home base, you likely also have a dedicated workstation setup, and if you’re like me you even have a standing desk and large monitor you’ve gotten used to. None of this is possible when traveling, so it’s important to dedicate time and simply do the work, as one of my favorite authors Stephen Pressfield talks about in his book. Perform your morning/daily rituals, eat healthy nutritious food that gives you energy, exercise, and do the most important tasks in your work every day. What gets measured improves. Tracking these actions and playing the game is not only fun and addictive, but it’s what will lead to improved habits and results and the impact of that will be seen across all the areas of your life. 5 points for completing your entire morning or daily ritual. 3 points for completing the most important aspect of your daily rituals, e.g., meditation. 0 points for not completing. 5 points for eating a healthy meal according to your nutrition standards and stopping when satisfied, not full. 3 points for eating a healthy meal, but overeating. 2 points for eating a cheat meal and stopping when satisfied. 0 points for a cheat meal and overeating. Note: Maximum of 15 total points from this category, based on a maximum of 3 counted meals per day. 5 points for completing your chosen workout, e.g., push-ups and yoga, jump rope and a jog, sit-ups and air squats, etc. Keep it simple. 2 points for staying active throughout the day, e.g. walk everywhere within a 30 minute radius, run up/down stairs (always choose the stairs over elevator), play with your kids, chase a dog, etc. Note: Yes, the 2 bonus points for completing your highest value task can be combined with other point categories within work for a maximum total of 7 points. Gamifying an experience like mastering the art of living is a fun way to improve our rituals. If we are what we repeatedly do as Aristotle said, should we not focus the majority of our time and attention on mastering these habits? Instead of allowing our environment to dictate our lives and habits, we can proactively examine why we do what we do and implement better actions. The REEP challenge is a fun and effective way for anyone who’s self-directing their life to get results starting today. Try the experiment out and measure your progress, and get ready to see tremendous growth and experience a sense of fulfillment. This idea is what gets me through my travels and I’ve even implemented a version of it in my daily life when at home. I’ve shared this experiment with many of my successful entrepreneur friends, and they all love it. I believe this is because providing a structure and framework to our habits makes it easier for our minds to know exactly what we need to do each day to continue growing and making progress. If progress equal happiness people are going to experience a tangible uplift in their mood, not to mention their actual results and successes. Note: If you really dig the experiment and find it useful, let me know. I’m considering expanding on the topic and creating additional tools and resources to make tracking and rewarding yourself easy.